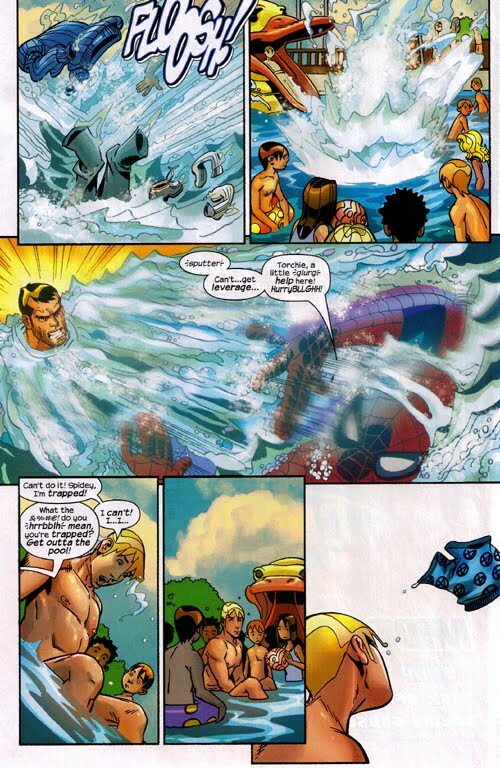 Today, a little something from Fantastic Four #512 by Waid/Wieringo. This is from the end of part 1 of a 2-parter called "Spider-Sense" in which Johnny Storm (aka the Human Torch), who is for the first time in his life a figure of public loathing, comes to Peter Parker (aka Spider-Man) for instructions on how to endure being a loser. Because Pete would know all about that. *By which I mean I have a loooooot of 'em. And a scanner. Oh yeah.